Sometimes mainstream furniture doesn’t quite cut it. You’re looking for more of a statement piece – something that you won’t see in the lounge rooms of all of your nearest and dearest. Or perhaps you’re just no good with an allen key, which rules out the array of flat-packs that magically turn into real-life furniture (give or take a few extra screws). Or maybe you fancy a life like Old McDonald, rather than a cramped studio apartment in the city. Or you’re bored with your pet mouse and want the company of a new furry friend. Whatever the reason, you should check out this range of animal chairs/stools from Japan. There are a range of different animals in the collection (from the farm to the jungle, via the forest) and they hold up to 80kg in weight. So you could sit on a donkey, giraffe, zebra or elephant (and a deer…at least I think it’s a deer). 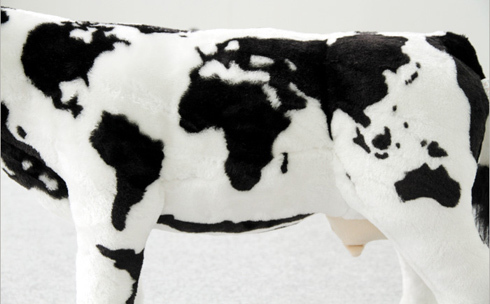 But I like this cow – it is cute and the Fresian markings are actually a map of the world, which is pretty cool. 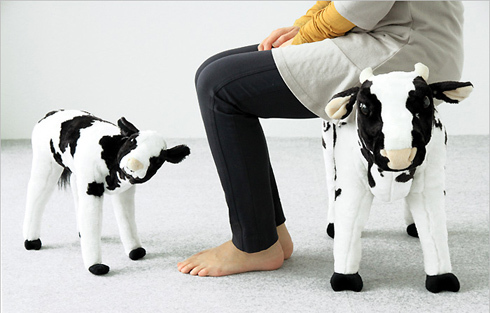 However, please note that, as in real life, adults shouldn’t sit on the small cow stools – it will not end well. 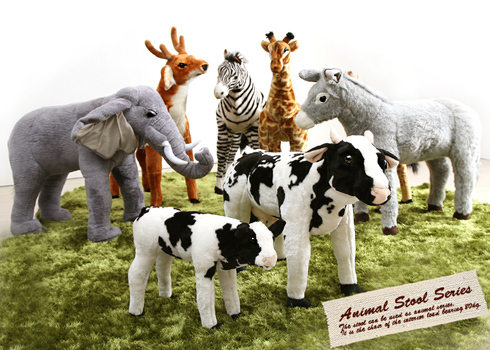 Want to moove (sorry, couldn’t help it) some of these into your home? Check out the collection on the Matomeno site here. Posted in Home sparks, WWWhat? I wonder if they considered having the model in the styled photo wear fluffy cow slippers? You don’t like them? If they were ordinary cow seats, I would understand – but these have markings in the shape(s) of the map of the world! Not since the ‘palm tree’ and ‘world’ developments in Dubai have I seen such ambitious designs. Then again, you do have a real dog, so maybe they appeal to those of us who prefer our house pets stuffed? It was a gentle prod (not of the pitch fork variety!) I think they are quirky & kitsch – and, therefore kinda’ coolio! I thought from the title of the post it was going to be a comment on people not teaching their pets to sit and how annoying that can be, I like the seats.